Dorothy Parker famously reacted to the ringing of the telephone with the phrase, “What fresh Hell is this?” Occupants of the White House could be forgiven for having adopted the same practice when it comes to Iraq, to say nothing of its broader neighbourhood. Since 2003 (and, really, for years before that) Iraq has become, with only the most fleeting exceptions, a source of nothing but the most exquisitely awful sort of news. But even by its own standards, the events of the past 72 hours have surely exceeded the expectations of even connoisseurs of tactical disaster. Events on the ground have been moving faster than anyone – least of all the government in Baghdad – can keep up with. But as of the time of writing, Sunni militants under the banner of the Islamic State of Iraq and the Levant had taken military control of Mosul, the country’s second city, as well Tikrit and its environs. With the national army sent into disarray and retreat, Kurdish forces have moved to assert their military control over their regional domain, including the long-contested city of Kirkuk. 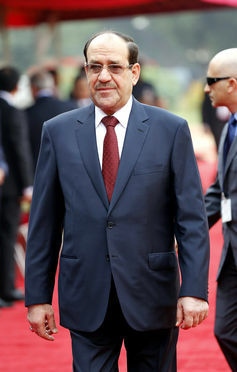 Meanwhile in the capital, prime minister Nouri al-Maliki, whose ruthless and authoritarian approach to embedding the dominance of his own Shiite faction in national government has contributed to the renewed uptick in sectarian violence, seeks emergency powers to facilitate a strike back against the militants. Thus far he has struggled to muster a quorum in parliament. Is it all Obama’s fault? Hanging over all this is the question of the United States’ role. After somewhere north of $2 trillion dollars spent and thousands of American lives sacrificed (to say nothing of Iraqi ones), can this harvest of ashes really be the sum total of what has been achieved? And wasn’t the worst case scenario of a fractured Iraq torn, wracked by extreme sectarian violence, supposed to have been averted by the surge of American troops in 2007 and the counterinsurgency strategy that went with it? It has been reported that in the run-up to the fall of Mosul the Iraqi government requested the support of US air power and was rebuffed. And the fact that no agreement was reached to keep a rump American military presence in Iraq after 2010 was the result not just of Iraqi reticence but also of minimal American interest in securing such rights. That, certainly, was the narrative that underwrote the withdrawal of all American troops under President Obama. Does that decision now look like an irresponsible rush for the door on the part of this president? 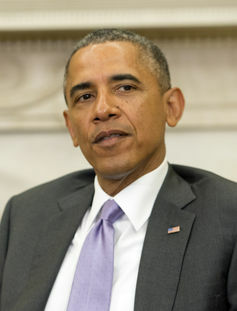 When viewed alongside the current withdrawal from Afghanistan, the “leading from behind” approach to regime change in Libya, and the minimalist approach to the agonies of the Syrian civil war (itself a major contributor to renewed instability in Iraq), does this add up to a president dogmatically turning his face against military intervention, even when the alternative is a major advance on the part of forces militantly hostile to the United States? Does Obama’s perceived inward turn, and particularly his aversion to any new or prolonged military entanglement in the Middle East, bear responsibility for what is now unfolding in Iraq? The answer is a qualified yes, but that answer must be placed in the context of the grimness of the options he faces. These options have their origins in the bleak legacy inherited from his predecessor’s disastrous strategic misstep in invading Iraq in 2003. Let’s recall the original rationale proffered for regime change in Iraq, by the Bush administration and its supporters (aside from the notorious disappearing weapons of mass destruction). It was argued that by overthrowing tyranny, and replacing it with a liberal democratic state where Sunni, Shiite and Kurd lived side by side in peace and prosperity, the United States would be facilitating the birth of a new a new role model for the Muslim world. They would be draining the swamp of disillusion, economic decline and extreme religiosity that had given rise to radical Islamist militancy. It seems remarkable now that this scenario could have been sincerely proposed by so many serious people. Yep, definitely in trouble either way. This best of all possible worlds having proven elusive, Obama faces an appalling set of choices in Iraq. These options are either (a) stand aloof and watch the most virulently hostile anti-American force in the world carve out a swathe of territory in Iraq and Syria to use as a base of operations; or (b) reinsert a level of direct American military force into Iraq which he has not previously contemplated, in order to aid a Baghdad government whose escalating authoritarianism and sectarianism – not to mention its close Iranian ties – have contributed to the insolubility of the conflict. Both courses will result in the hardening of anti-American anger among a large number of dangerous people. Neither is assured to work. Staying out may allow circumstances to unfold which later compel intervention against a direct security threat (see Afghanistan, 2001). Supporting Maliki directly even as he declares emergency powers and cracks down will re-establish a pattern of US support for antidemocratic strongmen as a bulwark against ideological enemies which has regularly generated blowback. 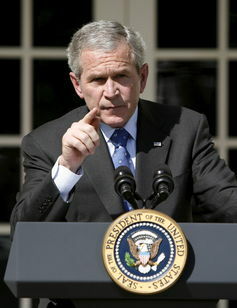 It should also be noted that this decision must be made in the context of a domestic political scene in which public appetite for major military intervention overseas is close to zero, and where – helped along by the inordinately expensive Iraq misadventure of the past decade – resource constraints are tighter than ever. President Obama is no isolationist, and to suggest that he is when he oversees the edifice of globe-spanning diplomacy, military presence and intelligence that he does tells us more about the imperial-level baseline of assumed for modern US foreign policy than it does about him. He is, however, a temperamentally cautious and realistic leader, whose core analysis hasn’t wavered much over his time in office. The way Obama sees it, the United States has suffered from a surfeit of counterproductive military interventionism over the past decade, not a dearth of timely force-exertion, the American people have no appetite for more, and he is disposed to give them what they want. Critique of Obama’s judgement in choosing between the array of bad options open to him at this time is justified. It is the administration of today that must answer for its decisions in response to the hand it has been dealt. And having had the scale of the threat thrown into stark relief by the events of recent days, he may be in the process of revisiting the assumptions behind his earlier disengagement. If there is deemed to be a real risk that the Baghdad government cannot fight back effectively against ISIS, a group whose status as a direct enemy of US interests cannot be disputed, then we should expect a grudging recommitment to direct action in Iraq. This president is nothing if not a pragmatist. But we should not forget that he has been forced to chose between courses of action which all seem likely to end badly, and this is the legacy of the American decision to invade and occupy Iraq in 2003. That is the original sin of American strategic miscalculation in the 21st century, and it will continue to define the terms of its engagement with the region for the foreseeable future.